Almost 500 Venezuelan migrants traveling to Ecuador from Colombia had to halt their journey when they learned that they needed a passport to enter the country. 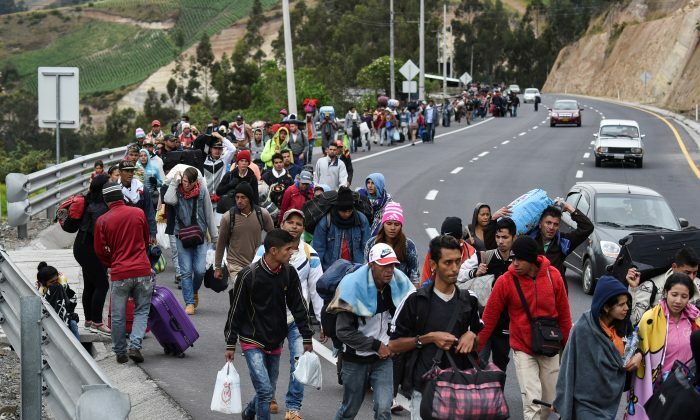 A mob of desperate Venezuelans numbering in the dozens, however, ignored the new requirement and simply forced their way into Ecuador without permission. The Ecuadorian government began asking Venezuelans to show passports, rather than their national ID cards, as of Aug. 18. The move came after the daily influx of Venezuelans reached 4,000, which raised concerns among the authorities. The Ecuadorian Ministry of Foreign Affairs explained in a statement that ID cards are easy to counterfeit. The officials argued that the change was necessary to increase security and prevent crimes such as human trafficking. Ecuador serves as a transit country for most Venezuelan migrants, whose preferred destinations further south are Peru, Chile, and Argentina. The United Nations estimates that about 550,000 Venezuelans have entered Ecuador this year, with 72,000 of them deciding to stay. After Mike Pence’s visit to Ecuador in June, the U.S. government gave $2 million to the Lenin Moreno administration to address the migration crisis. In total, the United States has provided $31 million in humanitarian and financial assistance to Venezuelan migrants, through the U.N. Refugee Agency and to other Latin American governments. The number of Venezuelans seeking asylum abroad might reach 3 million by the end of the year. “As for the next step, we’re asking the region’s countries to unite and seek a comprehensive solution to humanely handle the flux of these people who are desperately in need,” Nancy Izzo Jackson, deputy assistant secretary at the State Department’s Bureau of Population, Refugees, and Migration, said during a press conference on July 2. Many other Latin American governments are taking similar measures to that of Ecuador to keep Venezuelan migration under control. The United States, which received more than 27,000 asylum requests from Venezuelans in 2017, is a popular but more difficult destination because of the distance and travel costs. For instance, Peru, the new home to more than 350,000 Venezuelans, will start requiring passports on Aug. 25. Almost 32,000 Venezuelans live in Chile, where the government is stepping up efforts to formalize their migrant status and asking them to pay $50 for a certificate of criminal record. In addition, Brazil has been deploying military troops to enhance security at its border with Venezuela for some months. Just a day after Ecuador began requiring passports, a group of Venezuelans had already bent the rule. They spent the night in tents outside the Ecuadorian migration office, waiting for a response on their status. In the morning, when no answer was given to them, they crossed the border, and no officials stopped them. “We are not moving because we want to. The government is killing us on account of hunger. We are afraid to be denigrated,” said one of the Venezuelan travelers, Carlos Quinteros. He implored the officials to have pity on them. “We would rather die here than return.” El Comercio, a Quito-based newspaper, reported that he was able to get into a pickup and move on from the border. Later, at noon on Aug. 19, the Ecuadorian government announced four exceptions to the passport requirement, because the ombudsman of the country requested a reassessment of the situation. The exceptions are for: (1) underaged children entering with their parents or guardians—who must have a valid passport and documentation that shows their relationship, (2) married couples when one of them has a valid passport and the other does not, (3) Venezuelans who have been in Ecuador before Aug. 18 and are in family-reunification process, and (4) asylum applicants. The government also provided a six-month grace period for Venezuelans already in Ecuador to formalize their migration status. Further, to allocate more resources and money to assistance for Venezuelan migrants, three Ecuadorian provinces have declared states of emergency. On Aug. 5, a Brazilian federal judge in the state of Roraima, in the north of the country, ruled in favor of closing the border to Venezuelans until further notice. His idea was to open the borders once Roraima had created ideal conditions to handle the massive Venezuelan influx. Two days later, however, the order was overturned by the Brazilian central government, since it declared that closing the borders would worsen the humanitarian conditions of Venezuelans. The closed border also went against international migration commitments. Still, the Brazilian government deployed more security in the area—120 additional men—after the confrontations between locals and Venezuelan squatters on Aug. 18. A local business owner reported that he had been robbed by a Venezuelan, so a migrant camp in the town of Pacaraima was attacked by a group of Brazilians. That forced about 1,200 migrants to return to their country. The government of Venezuela has asked Brazil to safeguard Venezuelan citizens and take measures to secure their families and belongings. In the meantime, the Brazilian government has recommitted to supporting the Venezuelan diaspora until the migrants arrive at their planned destinations. More than 30,000 Venezuelans live in the state of Roraima, out of the more than 77,000 in all of Brazil. About 33,000 Venezuelans have requested asylum so far this year, which is already more than the 2017 total. No End in Sight: What to Do? Intellectuals, political influencers, and governmental authorities have shared their opinions about the Venezuelan exodus, including Organization of American States Secretary General Luis Almagro, who overtly opposes the regime of Nicolás Maduro and has called for opening borders throughout the Americas to Venezuelans.